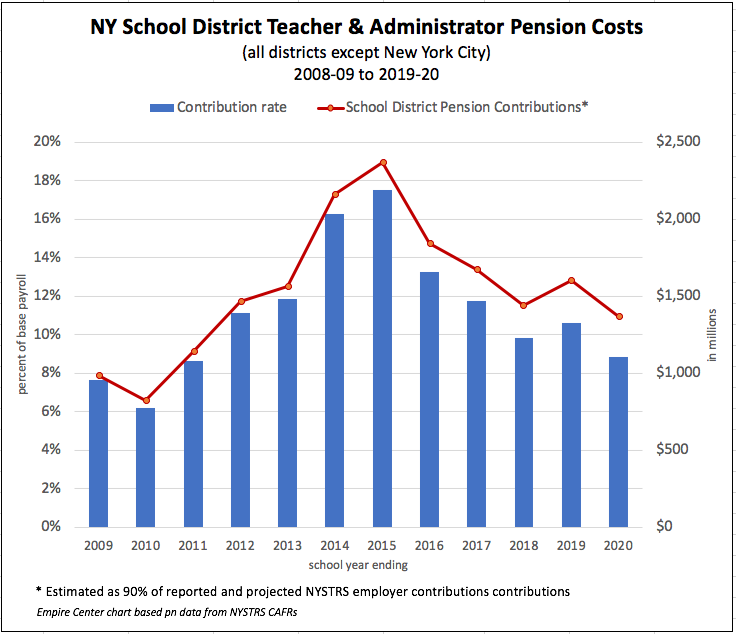 The New York State Teachers’ Retirement System (NYSTRS) will cut its employer pension rate by nearly two percentage points for 2019-20, reducing net costs to school districts by nearly $300 million. Last year, according to NYSTRS data, pension costs for New York school districts outside New York City were nearly $1 billion below the peak level of four years ago—generating a significant budget savings not often acknowledged in media coverage and debates focused on the impact of the state’s cap on school property taxes. Following the pension system’s huge investment losses in the 2008-09 recession and financial crisis, tax-funded contributions to NYSTRS more than doubled between 2009-10 and 2013-14, and the employer contribution rate ultimately peaked at 17.53 percent of 2014-15 payrolls. Since then, as illustrated below, a rebound in market returns has led to a sharp drop in pension rates and annual costs. Assuming NYSTRS school district payrolls continue to grow at the same rate as in recent years, the contribution for 2019-20 (payable in 2020) will come to $1.37 billion. The statewide cap on property tax levies, enacted in 2011, limits tax levy increases to 2 percent or the rate of inflation, whichever is less. Under the cap, any expense funded in one year becomes part of the base for purposes of calculating growth subsequent years—even when, as in the case of pensions, the expense has been reduced. The $933 million a year reduction in school district pension contributions between 2014-15 and 2017-18 was equivalent to 5 percent of property tax levies last year. As noted and shown in the chart, after a one-year uptick, projected school district teacher pension costs payable in 2020 will be a full $1 billion below the 2014-15 level. Adding to school districts’ financial cushions, the tax cap law excludes from the cap calculation any pension cost increase exceeding two percentage of covered payrolls. This provision was triggered once, in 2013-14 budgets, adding an average of 1.9 percent to the allowable levy limits and pushing the overall average school district levy limit to 4.6 percent that year. The added tax increases allowed by the 2013-14 pension exclusion has been baked into tax cap base calculations ever since. Given the large share of school budgets absorbed by teacher compensation, districts have used most of their pension savings to help finance increases in the main driver of future pension costs: teacher salary hikes dictated by collective bargaining agreements. Rising salaries are further compounded by automatic longevity step increases, which must be paid automatically even in the absence of a contract, thanks to the state’s Triborough Amendment. While other states grapple with serious pension funding shortfalls, NYSTRS consistently ranks among the best-funded public pension plans in the country. However, like all defined-benefit plans, it still poses an open-ended financial risk to future taxpayers, who must stand behind a constitutional guarantee of pension benefits. 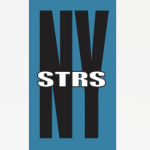 Given Wall Street trends since last summer, NYSTRS is highly unlikely to earn anything close to its assumed 7.25 percent rate of return on investments before its current fiscal year ends June 30. A prolonged bear market would inevitably push rates up again within the next few years. The Tier 6 reforms have reduced the so-called “normal” cost by slightly reducing benefits, raising full retirement age, and requiring employee contributions to the pension fund. However, the Tier 6 savings have been offset in part by changes in actuarial assumptions. Funding issues aside, the defined-benefit pension system is rigged to produce generous guaranteed retirement benefits for teachers who work at least 25 years, while short-changing a large number of teachers who leave before reaching the 10-year vesting period, or who suspend their careers for long periods to raise children. 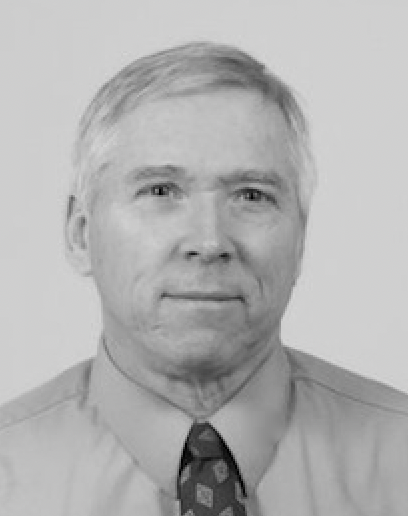 A better alternative, offering more retirement savings potential to non-career teachers and flat, totally predictable retirement funding costs to school districts, would be a plan modeled on the annuity-based defined-contribution accounts chosen by a majority of State University of New York faculty. A version of this option has been available to non-union political appointees and elected officials earning at least $75,000 a year. In a 2012 Empire Center survey, 71 percent of teachers said newly hired colleagues should have the option of choosing a SUNY-style plan, an idea that has also been endorsed in the past by the New York State School Boards Association. If the idea ever got traction in the Legislature, it would no doubt meet with resistance from New York State United Teachers—although the union would then have to explain why it wanted to deny school teachers a retirement plan preferred by the members of its largest second-largest local, United University Professions. NY school districts outside NYC are saving a hefty sum from a drop in pension costs, and more savings are on the way.